Students' lack of vocabulary can often be the most difficult part of teaching ancient history. Use this resource throughout your Ancient Civilizations Units to support and reinforce important vocab. 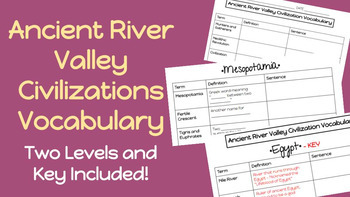 Have students define and practice using vocabulary words in sentences for each of the four ancient river valley civilizations! Students could also draw pictures or give examples of the vocabulary words in the "Sentence" column. A modified "fill in the blank" version and a complete answer key are also included!